I’ve been a fan of Cincinnati-style chili ever since going to college in Ohio, but recently I started thinking maybe it could all be cooked together with the pasta and turned into a casserole of sorts and this One-Pot Cincinnati Chili Spaghetti Bake was born. If you’ve never had Cincinnati chili, it’s packed with smoky, spicy chili flavor, has no beans and is served on top of spaghetti and underneath a pile of cheddar cheese. 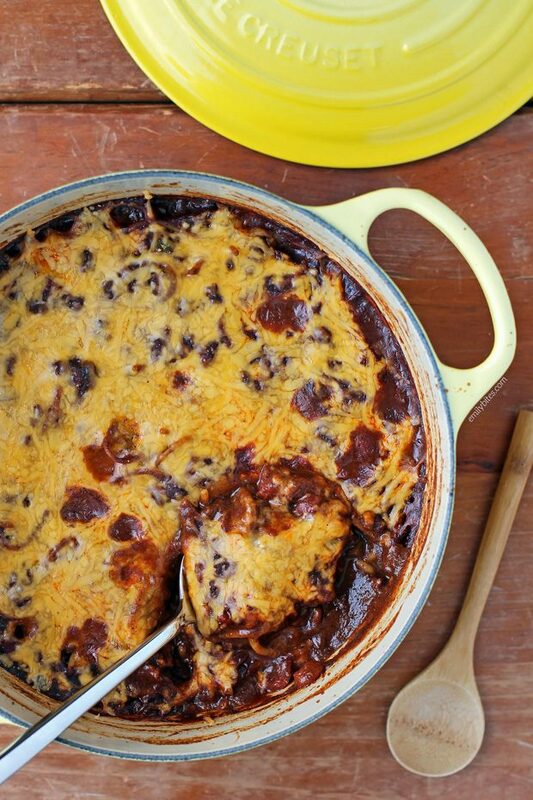 It’s delicious and definitely one of my favorite ways to eat chili. Obviously to make the normal version you’d cook the chili and spaghetti separately, but this one-pot version is a fun twist that leaves you with less dishes to clean! Back when I first started this blog, I made a version of Cincinnati Chili that I slightly adapted from the Weight Watchers website and the flavors were spot on. I used that recipe again to create this dish, adapting it to be a one-pot meal, and I loved it just as much! 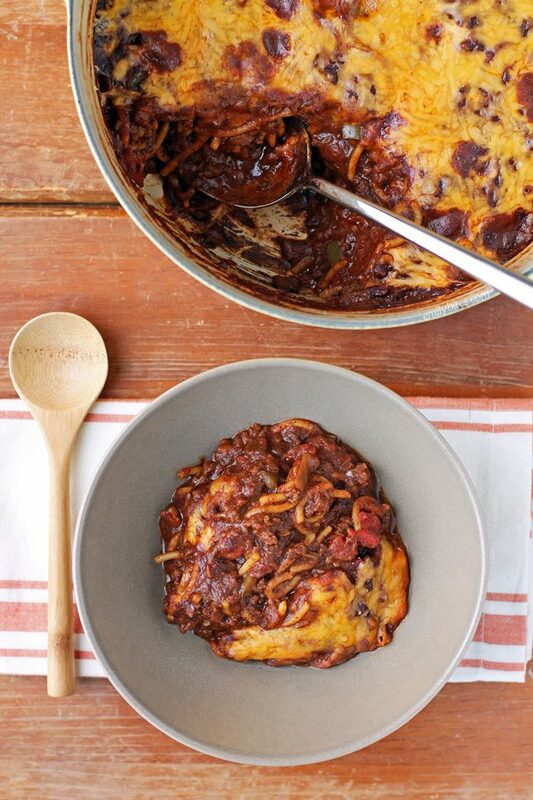 Not only is this One-Pot Cincinnati Chili Spaghetti Bake full of flavor, but a super filling serving of 1 1/3 cups is just 8 Weight Watchers SmartPoints or 377 calories. Looking for more lightened up comfort food pasta dishes? Check out the pasta section of my recipe index for favorites like Beefy American Goulash, Beef Stroganoff, Slow Cooker Kickin’ Chicken Pasta, Beef and Sausage Manicotti, Pumpkin Alfredo Tortellini Skillet, Spinach and Artichoke Lasagna Roll Ups, Chicken Cordon Bleu Pasta Bake, Tomato Soup Mac & Cheese, Spaghetti Pie, Sausage Tortellini Skillet, Buffalo Chicken Lasagna Roll Ups, Chicken Parmesan Stuffed Shells, Spicy Sausage Pasta and many more! Pour the oil into a dutch oven or large, deep, oven-safe skillet or pot and bring to medium heat. Add the green pepper, onion and garlic and stir to coat. Cook for 6-7 minutes, stirring occasionally, until the vegetables are softened. Add in the chilies, chili powder, cocoa powder, cumin, cinnamon, sugar and salt and stir to combine. Add the ground beef and stir to coat. Cook, breaking up the meat with a spoon until browned, about 8 minutes. Pre-heat the oven to 350 degrees. Add the tomato sauce, diced tomatoes, salsa, beef broth and water to the pot and stir together, using your cooking spoon to scrape up anything stuck to the bottom of the pan. Bring the mixture to a boil and then add the spaghetti pieces. Stir to combine and make sure the pasta is covered by the liquid. Reduce heat to low and cover the pot. Simmer covered for 15 minutes, removing the lid to stir every five minutes (to break up the pasta and scrape anything sticking to the bottom), until pasta is cooked. Stir the chili/pasta mixture again and place it uncovered into the pre-heated oven. Bake for 20 minutes and remove from oven. Sprinkle the shredded cheese all over the top of the chili and return it to the oven for another 5 minutes until the cheese is melted and the chili has firmed up, soaking up much of the excess liquid. Allow to sit for about 10 minutes before serving. Do you know how the points would change if I used ground turkey instead of ground beef? I made this tonight with ground turkey instead of ground beef…only because I had it our already. It was delicious !!! Will definitely make again!! Where do you find 50% reduced fat cheddar cheese? What’s the brand? I just can’t ever find it! My apartment complex is next door to a Skyline but I make your recipe (most of the time). Can’t wait to make the one-pot version and tell my WW group about it. I’m still using point plus program–by any chance do you have the smart points for your original Cincinnati Chili?? Love Cincinnati Chili, so will definitely try this recipe. Looks delicious! Made this for us for supper tonight. We had never had this type of chili before and we found the flavor profile super unique. I made it a little spicier by adding 2 diced serene peppers to the mix plus I threw in some mushrooms that needed using. I realize that deviates somewhat from the recipe but the other veggies mixed in nicely. Thanks for another great recipe. Love your blog. Hi Emily! I don’t know if you would have the answer to this but I don’t have a dutch oven or an oven-safe pot. I was wondering if I cooked the chili on the stove but then transferred it to a 9 x 13 casserole dish and placed it in the oven? Do you think that would work? Thanks! I’m eating primal right now, so I made this with roasted spaghetti squash instead of spaghetti and left out the added sugar. I also left out the cup of water so it wouldn’t be too watery. It turned out really well and still felt like I was eating something worth way more points! Easy substitutions to make it more low carb. Hi Emily! Made this for the first time and loved it!! Question…when I used the WW calculator and used the nutrition information that you posted (so based on your ingredients), it came out to 11 points/serving rather than 8. Do you know why that might be?? Thanks!! I made this tonight and loved the flavors but it was so spicy we couldn’t eat it. Did I do something wrong? Can I use less chili powder next time? Does this get spicier the longer it sits because mine had to sit for a couple of hours before hubs came home but it was off the heat. Just not sure what I did wrong. Ended up having to throw it away because it took your breath away it was so spicy. Hi Elena! I think this answer from my FAQS will help. Enjoy the recipe! This was delicious! For health reasons I decreased the sodium by using salt free or low sodium options of the canned items and did not add salt and didn’t miss it at all! My family raved about this one so it will definitely be added to my regular meal planning!! I made this tonight and it was absolutely delicious!! I cut back on the chili powder for personal preference, but this is so flavorful and filling and yummy! My husband couldn’t stop raving! Thank you!! I made this last night, and minus a few issues that I’ll correct next time, it was well worth it! It was very cinnamony though. I reheated leftovers for lunch just now and all I can smell is the cinnamon! LOL! Has anyone else had that happen? I’m eating primal right now, so I made this with roasted spaghetti squash instead of spaghetti and left out the added sugar. My family raved about this one so it will definitely be added to my regular meal planning!! The food is delicious, thank you for sharing.